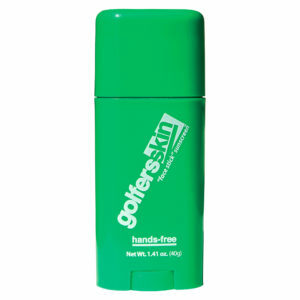 Golfersskin Sunscreen: the ultra-performance spf30+ and spf50+ broad-spectrum, sweat proof and waterproof sunscreen developed in extreme New Zealand and specifically formulated for golfers. With over 260+ PGA Tour Players trusting Golfersskin for performance and protection, see why we’re the #1 sunscreen used in golf.™ When the sun’s rays are absolutely relentless, Golfersskin offers total UVA/UVB broad spectrum protection from the elements. No matter how much you sweat, its non-greasy formula won’t run into your eyes, and most importantly will not interfere with your grip when you’re lining up your shot. Golfersskin leaves you free to focus on what really matters. Note: Golfers and farmers are the most susceptible groups for melanoma in the UK. The incidence of melanoma and skin ancers are greater in the South-West of the UK than in Australia. Golfersskin partners with the doctor-led Skin Care group. Golfersskin spf50+ is approved by the International Melanoma Society – one a very few sunscreens awarded this prestigious approval.